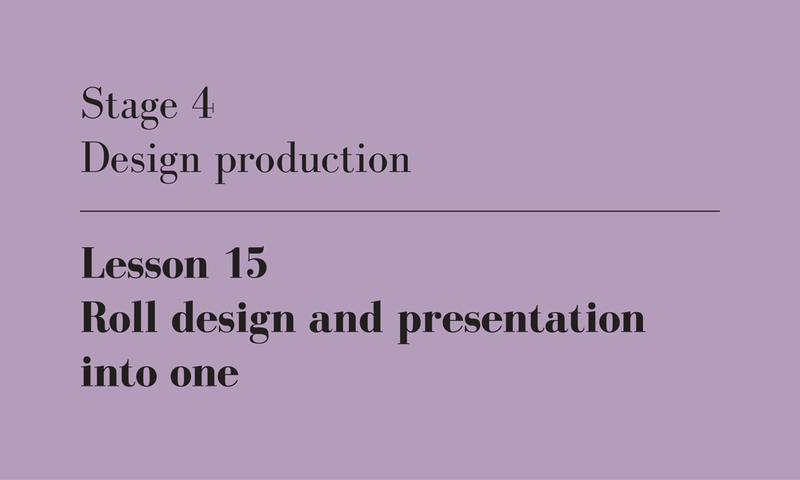 This is the 15th of twenty-one lessons for design students, gathered from the combined experience of being a student, and teaching students. I will published one lesson each weekday until they’re done. The design of your project and the presentation of your project are not separate exercises. They are fundamentally interconnected, and should be developed in conjunction with one another. First, you need to find a way of distilling an entire semester’s worth of work into a few drawings, a model and a quick monologue. Knowing what to emphasise and what to throw away is a hard task. Don’t be lulled into thinking that the project that’s in your head and the one on paper are identical: almost certainly there are facets to your design that you think are as clear as day but are in fact entirely missing. Beginning the presentation phase of your project earlier allows you to uncover many of these missing pieces. I can only respond to the material you show me, so lay out what the end of your semester is going to look like and I will give you feedback. Just as importantly, the very act of explaining your evolving presentation material over and over again will do most of the work for you: practice makes perfect. Second, presentation is the most strategic part of your semester. It’s where you decide what to show and what not to show, or what you need to spend time on and what you don’t. The scales at which you present your drawings will determine how much detail is visible. The angles from which you render your project will determine the parts you don’t need to model. The layout of your panels will determine how many drawings and renders you need in the first place. The more you can leave out of your presentation, the more time you can spend on the bits you leave in. Reams of paper (or streams of pixels) filled with incomplete plans and low quality renders are almost worse than blank space: they are unfulfilled promises. And third, do yourself a favour and begin work on your presentation material before you enter the twilight zone that descends at the end of semester. Good decisions are not made at 4am the morning of your due date. I remember having to draw a section detail through one of my projects in second year. It was the night before the project was due and I was knackered. The next morning I was surprised to discover that I had drawn the top half of the detail at 1:5 and the bottom at 1:10. More recently, and in contrast to my fatigue-induced mistake, one of my students a few years ago started bringing presentation-ready images to our studio sessions from as early as week 8. The rendering software she was using made this easy, but it was a stroke of genius to commit to the final images so soon. I was able to provide feedback early enough for her to make meaningful changes, she was able to resolve all her questions of light, shade and materiality, and by the time her final presentation rolled around, every single image on the screen had been iterated multiple times. Roll design and presentation into one, author’s own image. I found this lesson particularly pertinent last year. There’s a bit of insecurity tied to the gravity of having presentation thought through, as it can feel as if it takes away some of your flexibility to fart around and pussyfoot, but once you’re able to get out of that comfort zone you realise how powerful (and liberating) it is to escape that vacuum and recalibrate and distill your sense of what’s actually important.